Hangsterfer’s has over 75 years experience in the research, development and manufacturing of high quality metalworking lubricants. With our experience we are able to consult with you to select the highest performance lubricant to meet and exceed your needs. 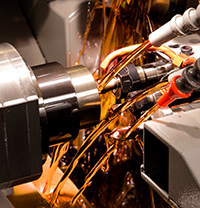 Our certified metalworking fluid specialist can help you to find the Next Generation® of technology in metalworking lubricants. Our consulting services and Metalworking expertise are an important part of the exceptional customer service Hangsterfer’s is known for and has been recognized for decades throughout the industry. As new requirements and technologies develop in the Metalworking industry we are often called upon by our loyal customers and end users to help them keep one step ahead of the curve. For more information and details on how we can help you, please CLICK HERE to have a Hangsterfer’s Metalworking expert contact you and assist with your needs.